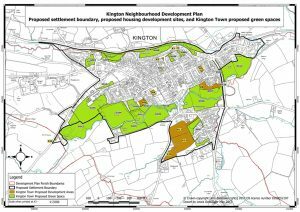 Approximately 200 new homes will be delivered in Kington between 2011 and 2031, with sites allocated through a Neighbourhood Development Plan. Sites within the existing confines of the town are constrained in terms of flooding. Developing peripheral sites will require compromise in terms of effect upon the landscape. Choice of sites should seek those with least impact and where the provision of significant landscape and townscape mitigation measures can best be achieved. Phasing will be necessary to overcome current infrastructure constraints. See What you said in the Results & Analysis report from the consultation and questionnaire. Housing: What are the Issues? 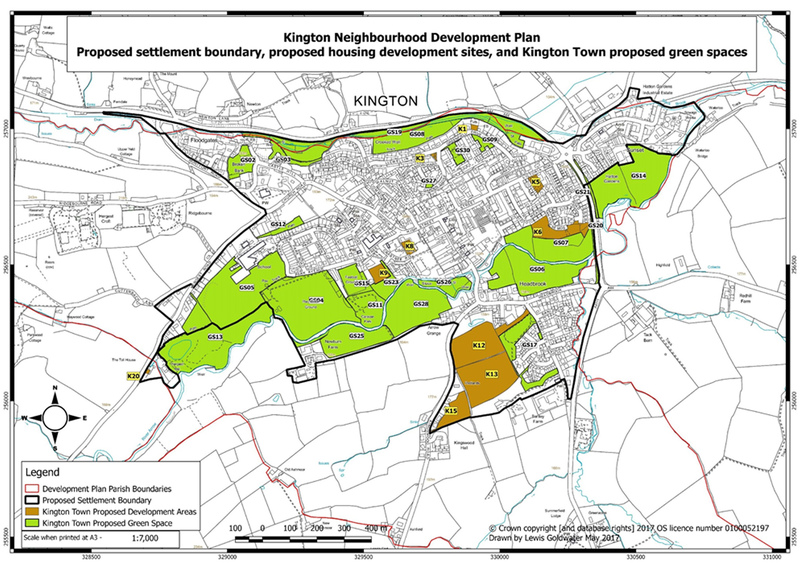 Herefordshire Council has given Kington Town a target of about 200 new homes to be built by 2031. (Herefor dshire Council has decided that we can include some recent development, so our number of new homes to be built is now around 150). We cannot reduce this number because it has been set to help meet the overall target for Herefordshire agreed with the government. 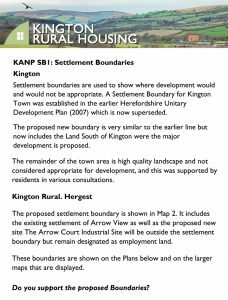 But the responsibility of identifying sites for the new housing has been devolved to Kington people through the Neighbourhood Plan. See the map of all of the potential Housing sites which are currently being considered. Where do we want new homes built? 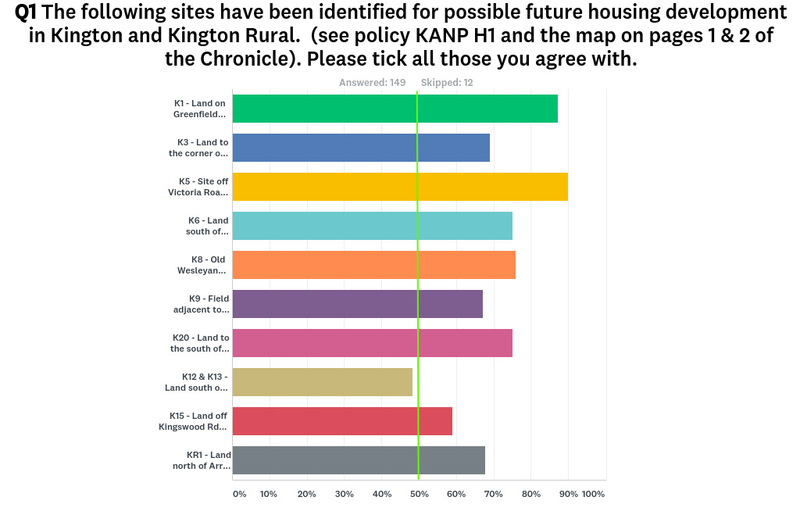 The KLAP survey showed that the majority of people would like development in small clusters, preferably on ‘brownfield’ sites. Unfortunately there aren’t many of those in the town and there are difficulties, such as lack of parking space, with ‘in-filling’ in small spaces. We must therefore consider some greenfield sites on the fringes of the town where landowners are willing to have some development. What kind of new houses do we want? 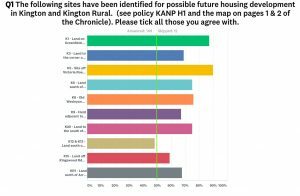 The KLAP survey showed that people want a mix of houses– family homes, some bungalows, homes with flexible space to allow ‘working from home’, homes with gardens and parking spaces, and play areas, with easy access to the town centre. Everyone wants low maintenance and high energy-efficiency. We must have planning policies that require high quality design, so that new homes will be affordable and sustainable and good to look at in the environment of a small rural town which has a lot of notable historic buildings and features. When do we want them built? Huntington, Kington Rural and Harpton. 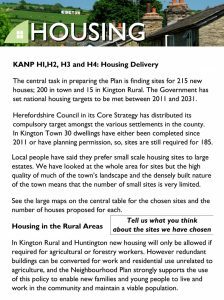 No targets have been set for Huntington or Kington Rural and Lower Harpton in the Core Strategy. Any building in the two areas will be limited to individual applications for essential needs such as agriculture, forestry, re-using redundant buildings such as barns, and a few other exceptions. However, if either community wishes, and has good reasons, a small number of additional houses under the Neighbourhood Plan could be specified. What do you think – let us know. For whom? Incoming families, retiring couples, those with jobs, those without jobs? How much existing housing is vacant and why? Re-ruralisation? Allow small holders to build on their acre? Provide for self-build? 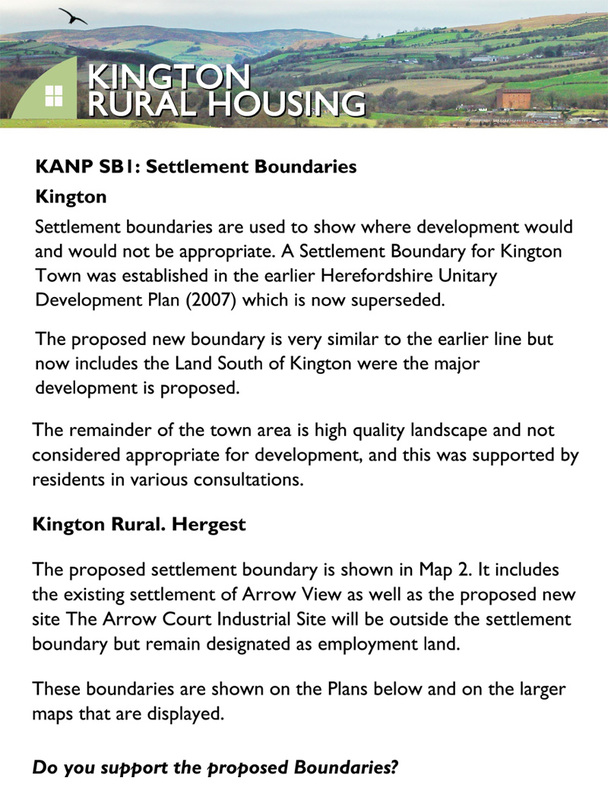 I have examined the recently published draft plan for potential housing sites in Kington, and was surprised to see the inclusion of the flood plain meadows between Headbrook and the River Arrow, despite previous planning refusals on this land. I believe the inclusion of this land is ill considered for the following reasons. This area is important flood plain as clearly emphasised by planning refusals for earlier proposals for housing development on these fields. The importance of retaining land to absorb flood waters will become even more important in the future with the increased rainfall resulting from climate change, and the additional surface water run off from the hard paved areas of any new house building. These flood plain meadows have been in continuous use for hundreds of years. Trees provide shade for grazing animals in summer on this ancient farmland of outstanding natural beauty. Old established, traditionally maintained meadows have a rich ecosystem of flora and fauna, and this area deserves a proper ecological study and species count. Barn owls, which are an endangered species, nest here, and deer can be seen drinking in the river in the early morning. In environmental terms it is vital to retain such species-rich areas which are fast disappearing from our landscape. There is a well established town planning principle that recommends the inclusion of ‘green fingers’ allowing corridors of open countryside to penetrate into the heart of expanding urban areas. Kington is fortunate in having these green fingers already in place along the River Arrow, each side of the town bridge. Any proposals to build on these would be counter to this principle. 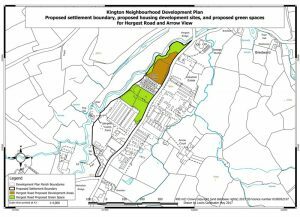 As more development takes place to the south of the river, these ‘lungs’ become even more important for the well being of the people and wildlife of Kington. Many residents and visitors to the town stop off to admire the wildlife and scenery visible on and alongside the river from the town bridge. This is an important amenity that would be seriously compromised by housing developments in these meadows. All these factors suggest that it makes no sense whatever to construct new areas of housing on the water meadows alongside the river, and thereby deprive the town of an important amenity. If this land becomes available in the future it is the perfect site for a nature reserve. 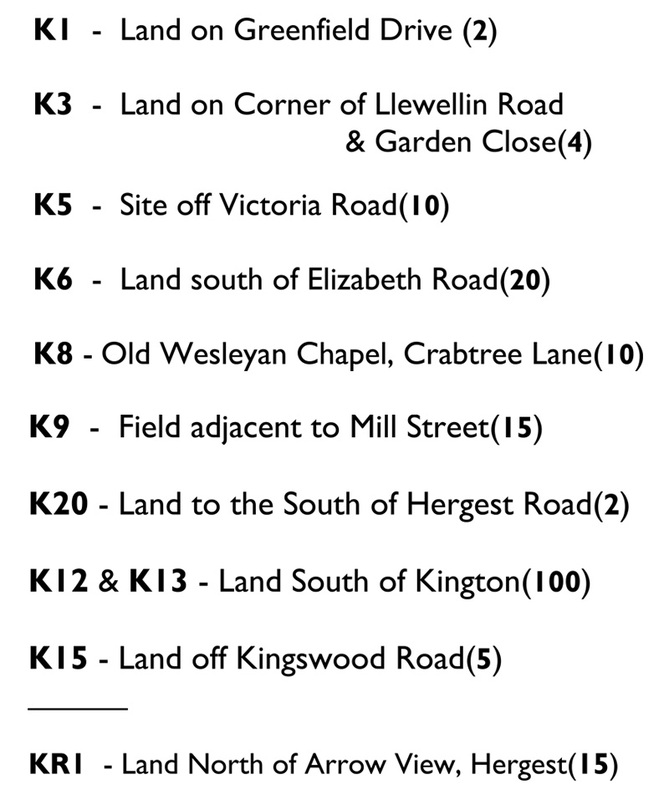 The future housing needs of Kington can be met by small clusters of homes to the south, along the Kingswood Road, with particular attention being paid to the absorption of surface water within these sites. We have seen a copy of Brian Brown’ s comments in relation to the proposal to include in the Draft Plan the meadow between Headbrook and the River Arrow as a potential housing site. We are in agreement with him, and confirm that it does appear to be markedly ill advised when the meadow comprises a flood plain area, which flooded halfway across the meadow as recently as October 2010. It is also now the case that building development on or near flood plain areas is now clearly regarded as being unwise, especially in view of recent flooding problems within the UK. The use of this meadow for development purposes would also take away from Kington one of the few surviving green spaces within town limits. It is a meadow of considerable natural beauty with flora and fauna established long ago; there is considerable bird life including barn owls and buzzards, not to mention the stretch of river inhabited by brown trout, where dippers are in residence, kingfishers can be seen and where we are informed that salmon spawn, an activity unlikely to survive adjacent building development. The meadow is grazed for eight or nine months a year by sheep and cattle, using the existing trees as shade when necessary, adding to an idyllic landscape the like of which should be preserved as essential to our environment. Even if the proposed building works were not immediately adjacent to the river with its attendant difficulties, the amount of concrete that would need to be sunk for foundations and elsewhere in carrying out the development, would inevitably upset the current balance of surface water drainage, and be likely to cause a flood risk to buildings situated on adjacent areas not previously at risk. Additionally, the owners of the proposed new houses would almost certainly find it impossible to obtain flood risk insurance, thereby making the newly erected properties extremely difficulty to mortgage. We moved to Kington in 2000. Since then a proposal has been made to build on the field behind Headbrook 3 times and 3 times we and some of our neighbours have written to Hereford Council Planning Dept outlining our objections and 3 times the Council has agreed with us and turned down the development plans. This is largely because the whole area of fields behind Headbrook and at the back of the roads leading off behind Duke St…..The Meads, Elizabeth Rd. etc is a flood plain, and there are also problems of access. Of course I would not want to see the fields behind Headbrook built over as it is a lovely green space in the town. When this area was proposed 3 times before there was always the problem of where to make the access road as well as the overriding consideration that it is a flood plain. The public park idea would only need an access path for pedestrians. 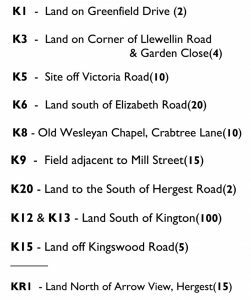 The other house symbols on the page of the Chronicle showing potential housing sites are on higher ground although care should be taken there with excessive tarmac and paving because I was told that Kingswood Rd. once flooded down into the town. Perhaps Kington really needs to seriously consider flood planning. 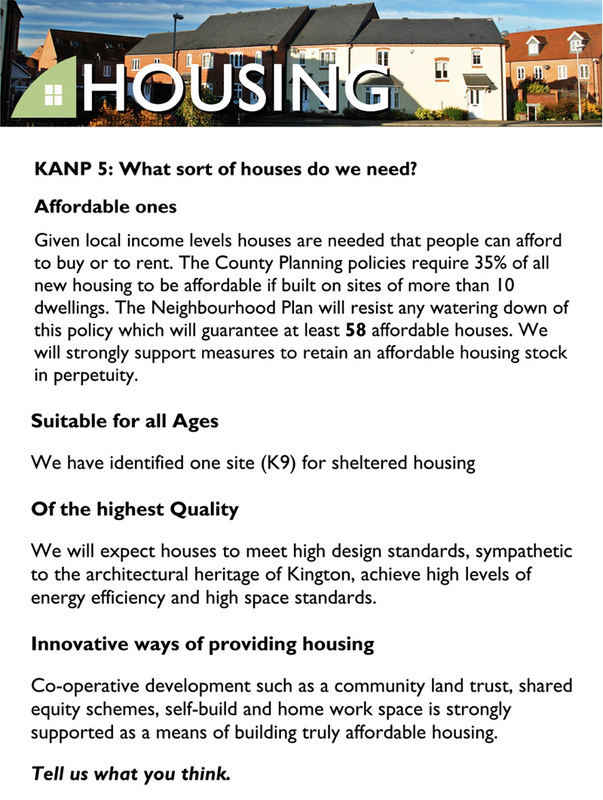 The following are suggestions which I feel may allow Kington to keep its special character and yet deliver change. Encourage planning applications for small scale mixed housing/workplace development, particularly on brownfield sites. Make transparent desirable criteria for successful applications to encourage individuals to apply who do not have funds for speculative proposals. Choose larger potential site with due regard to environmental results, i.e. possible impact on water run off as well as visual impact. Ensure that development is of a high quality and diverse in apppearance and size. Develop the idea of an Eco-Village and explore existing “Eco” developments which have also generated employment opportunities. When walking around Kington, our own thoughts are that unused/vacant brownfield sites should be utilised whenever possible. There appear to be numerous vacant properties and many others that have been on the market for some considerable time. Encouragement should be given for Retail premises in the High Street/Bridge Street to develop flats and housing on second floors etc. What number of shops have accommodation which is not utilised and under developed? The refurbishment of these premises would enliven and brighten the area which would then reinvigorate the town centre, especially if plans could be worked out for the road to be pedestrianised or traffic restricted/rerouted. Of the long time vacated premises, what is happening to the Queens Head? the Wesleyan Building and land? the former Builders Yard and a former shop in Duke Street? the various obviously vacant properties in Bridge Street,the High Street and elsewhere? It would seem to be logical to take advantage of these for redevelopment/refurbishment for housing. The Cattle Market appears to be under utilised, being occupied only at certain hours on various days during the month. Other towns and cities have seen their markets of all types moved to outer areas for easier transportation reducing congestion.. 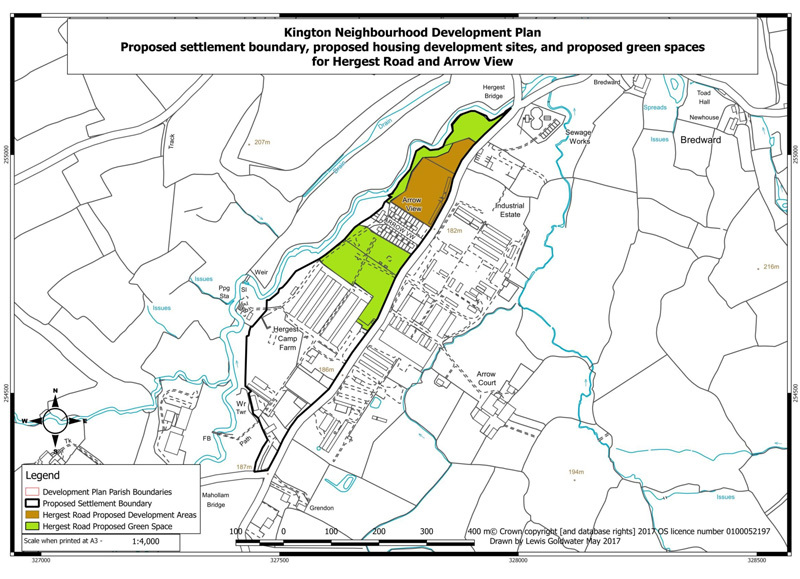 This would release land within Kington for housing development. On the outskirts, land which has been developed in the past but is currently unused, near to the Arrow Industrial Park has potential to be improved and offer housing or factory/office units for linked employment. Kington is classed as a Walking Centre and is endeavouring to encourage tourists and visitors who appreciate the scenery of green fields, hills and countryside. It is imperative that brownfield and previously used sites are utilised rather than remaining blighted, untouched and unoccupied. The access from Headbrook into Kingswood Road is narrow and unsuitable for an increase in traffic especially larger lorries and construction vehicles. Due to old established stone cottage terraced properties situated near the junction not having garages, residents utilise the road for parking their vehicles and even now the narrow road only offers space for a car to pass “single file” I have seen bigger vehicles having to make use of the footpath! Additional traffic usage would cause chaos and frustration for the current residents. On again viewing the maps for suggested development. we noted that although not shown within the Kington Chronicle edition, an area along Eardisley Road, almost opposite the newly built Medical Centre was a potential site. This area would have convenient access from the wider and suitable A road. It would be easier for Construction and HGV vehicles to enter during development, and similarly when occupied, homeowners’ vehicles would be directed towards the A4111 and roundabouts onwards to Hereford, Leominster etc. Bus services already operating along this route would have this additional stop in or out of Kington for the residents to encourage the usage of public transport with additional services organised,subject to the demand shown. This area already has development further along the Eardisley Road and, in our opinion, would appear to be the most suitable option. Other remaining potential sites, we understand from comments made, appear to be of wildlife interest or near a flood plain. 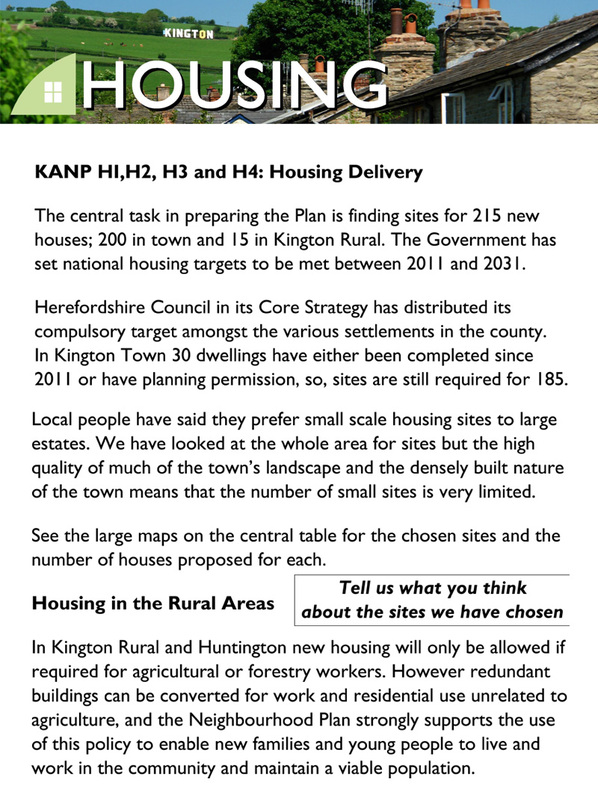 There should be inducements stated in conjunction with any housing development, to encourage employment development and refurbishment of small factory units (Hatton Gardens, Arrow Court etc) We would not wish for Kington to become a “ commuter town “ and the aim should be that those of employment age work and live locally as much as possible. Income is more likely to be spent locally in conjunction with any integrated High Street planning. Otherwise, who is expected to buy/rent all these properties when there are so many existing houses that have been for sale over a lengthy period, and with little employment in the area. Surely, it is better to utilise and take full advantage of the current potential housing stock and redevelop brownfield sites, some of which we may be unaware of. I very much agree with the comments of Ian Caney above. 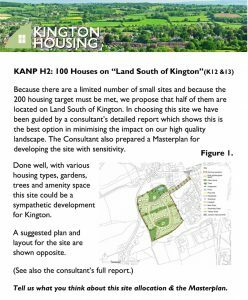 We need to be specific about suitable sites in the interests of Kington as a whole, from both visual and practical standpoints, inspite of predictable ‘not in my backyard reactions’ and whether or not the particular land is available. Circumstances and views can change and an overall draft physical plan can develop interest and investment over time. 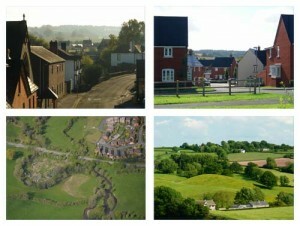 There are considerable numbers of terrace houses in Kington occupied by all social groups. These can provide high quality dwellings at economical cost, also using land efficiently. We do not need to park cars outside our dwellings and well planned and landscaped shared parking may use land more efficiently, as established patterns in the town. 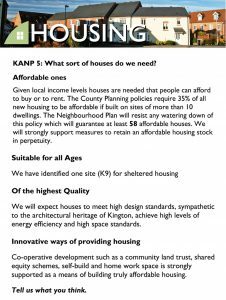 Given limited areas of land available for housing expansion it is probably not practical, or appropriate to Kington, to cater for, say, 4 or 5 bedroom ‘executive’ type dwellings. This area is generously laid out with ample green space and parking. The large grassed areas approached from Gravel Hill Road provide an open aspect to the houses in contrast to later schemes. The southern part of this area could be built on in a modest way without detriment to the estate. A compact block , similar in concept to the Greenfields flats just to the west of this, could provide ,say, nine flats in all on three floors, taking up minimal land area. They could have balconies overlooking communal areas but would be for those who had no need of private gardens. There is a further potential site to the north of this, presently a substantial gap between two houses presumably for maintenance of the wooded slopes down to the bypass behind. A further three- storey block of ,say, nine flats could be accommodated here, still leaving a generous access to the wood. To the west of this site at the junction with Llewellyn Road is a block of garages on a prominent corner consuming an unnecessary amount of space. The appearance of this area could be greatly improved if the garages were rebuilt as a scheme of flats with garages or car spaces under. A three storey project similar to Greenfields could accommodate, say, eight flats in total on the upper two floors. Building anywhere is going to aggravate someone. I ask you please don’t build on my garage. 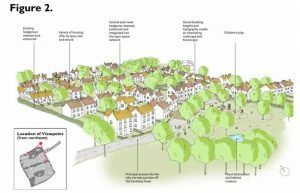 Sites behind and to the north east of the Oxford are understood to have planning permission for respectively for four dwellings in a conventional estate type layout and for a single larger dwelling. 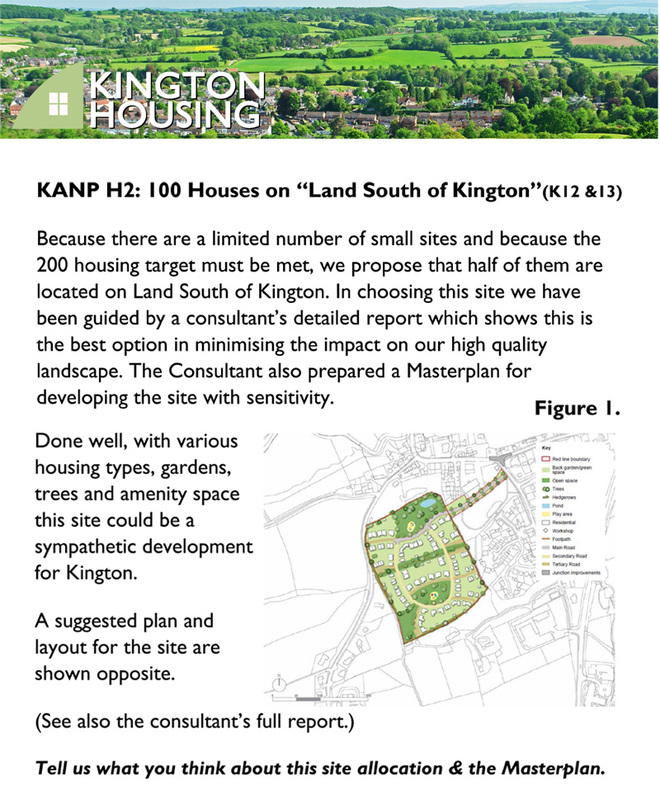 The estate plan consumes land at the expense of garden space in a layout unsympathetic to central Kington. Grouped parking at the site entrance might achieve a more appropriate density and layout of, say, six plus two houses, not necessarily with full car ownership in this central location. Beyond the present cul-de-sac to the east a short footpath leads to an unused paved area further along the meadow edge. The purpose of this is not obvious, perhaps also to do with a future phase. There could be an opportunity here to help terminate the development with some additional building , without further encroachment on the meadow. A small three-storey block of flats could take advantage of meadow views. The cattle market site is often busy on a Thursday each week and the large area to the south of the market itself is essential for the parking and manoeuvring of the larger transporter vehicles. But there is a narrow unused strip of land fronting Tanyard Lane at its east end which is a possible site for housing. A scheme of terrace housing, say, six dwellings with south facing gardens could occupy an area above the bank to Tanyard Lane. A vehicular access could be formed from Love Lane along the north side of the houses with hammer head at west end and with a new boundary with the cattle market along the side of this. continued. Say, eight single storey houses could be designed here to look across the town and only visible from the distance. Am responding as a member of KANDP Steering Group. Thanks for comments and suggestions. Some of the sites suggested by David Raven have already been considered; 2 have planning permission for housing, there are flood zone problems with a couple, but others need further consideration and I hope we can do some work on assessing them quite soon. We are all conscious of the need to avoid building where there are sensitive landscape issues and would prefer brownfield sites, but ideal sites appear to be limited!